This tutorial provides you with a foundation for working with online sharing in Adobe Photoshop Elements. It is the sixth lesson in the Adobe Photoshop Elements 10 Digital Classroom book. Online services let you order prints, photo books, and other photo products on the Internet. There is no charge to join a service, but you need a valid e-mail address to receive correspondence, and a credit card number to place an order. The online services available to you depend on your location. For example, online ordering services differ between North America and Asia. The options available change dynamically to show what’s available in your area, and updates when new services become available. As of this writing, Kodak and Shutterfly are the online print partners available in the Windows version of Photoshop Elements, and Kodak is the only print partner available in the Mac OS version of Photoshop Elements that you can order prints from directly within Photoshop Elements. Photoshop Elements allows you to order professionally printed photos and have them mailed to designated recipients. You should, however, make any desired changes to photos before ordering prints, as not all online services allow you to enhance photos. 1 Make sure that you are in the Create tab, and, in the Media Browser, select the photos you want to order by holding down the Control (Windows) or Command (Mac OS) key. 2 Choose File > Order Prints and choose the service you’d like to use to order your prints, or press the Photo Prints button in the Create panel and choose your desired service from the Create panel. Photoshop Elements 10 offers the choice between Shutterfly (Windows only) and Kodak (Mac and Windows). Both these services offer free accounts, but you must have an existing account to use these services from within Photoshop Elements 10. You can order prints through online services. If this service is available in your area, you can also choose Photo Prints from the Create tab. If you have not signed up for Shutterfly or Kodak EasyShare, you will have to complete the form before you continue. If you choose not to join at this time, close the Order Prints window and proceed to the next exercise. 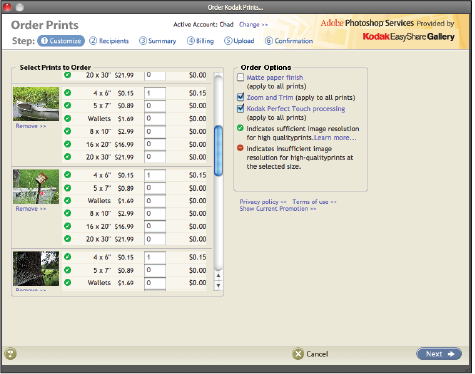 3 Specify the size and number of each photo you want to order, and then click Next. 4 Select where to send the prints, then press Next. 5 Confirm your order details, and add more recipients if desired. Press Next. 6 Choose a shipping method and coupon information (if applicable), and then press Next. 7 Enter your credit card information. Then press Place Order to order your prints. With Photoshop Elements, you can order a professionally printed photo book and have it delivered to designated recipients or you can print a photo book on the printer attached to your computer. Your photo book can contain various numbers of photos on each page of the photo book. You should, however, make any desired changes to photos before ordering a photo book, as some online services do not allow you to enhance photos. 1 In the Media Browser, select the photos you want to use. Photo projects (in PSE format) can also be used to order photo books. 2 In the Create tab, choose Photo Book. The Elements Editor launches and the Photo Book dialog appears. Choose a size from the pane in the left column. Note that some sizes belong to a specific service (Shutterfly or Kodak) however all the sizes can be printed locally on your desktop printer. Choose a theme to be applied to your photo book, and the Preview pane updates to reflect the selected theme. Enable the Autofill with Selected images checkbox to use the images selected in the Media Browser to populate the photo book. If desired, enter a number of pages for your photo book as well. Click OK. Choose Photo Book from the Create tab. 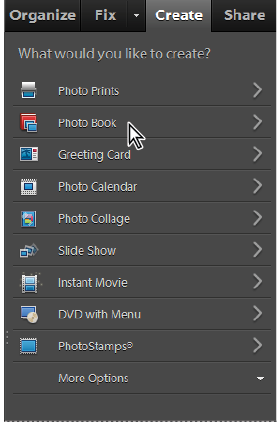 3 Photoshop Elements generates the photo book and displays the pages in the Task pane. Kodak printed photo books have a cover that is designed to show a single centered photo on the title page. For best results, make sure your title page (or first page) has a single centered photo. 4 Use the page navigation buttons at the bottom of the main window to navigate and view pages in the book. 5 Click on the drop-down menu in the Project bin and choose Show Files selected in Organizer to display the original photos that you selected in the Organizer. Drag and drop any of the images from the Project Bin onto a placeholder in the layout to replace an existing image. 6 Change the cropping and scaling of an individual photo by double-clicking on an image and adjusting the slider to change the scaling percentage of the selected image and click and drag on the image to reposition the image within the placeholder frame. Click the green checkmark icon ( ) to commit the change. Simply click once on the image and drag to reposition the entire image and the frame. Adjusting the scaling and positioning of an image within the placeholder frame. 7 Under the Create tab, click on the Layouts, Artwork, and Text buttons to customize the book. 8 Press Order to complete the photo book. A dialog is displayed indicating that this process could take between 5 and 20 minutes to complete. Conversely, click the Done button to complete the photo book and save to the Organizer. 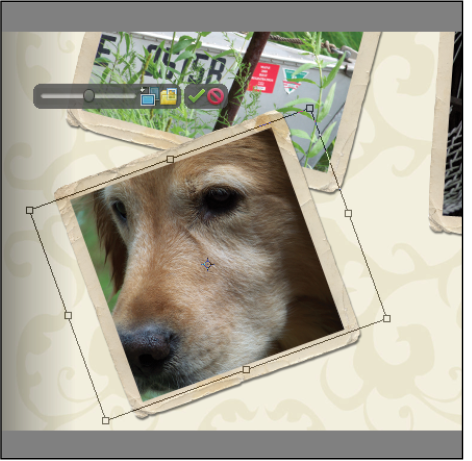 Customize your photo book with various layout options. 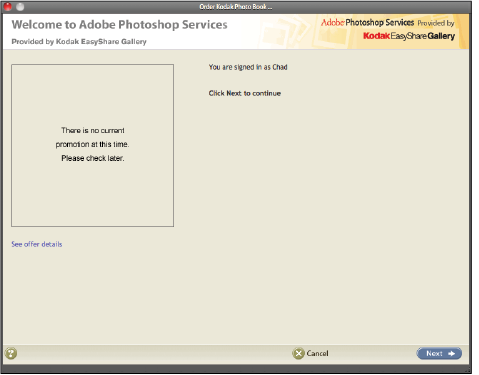 9 When the Adobe Photoshop Services browser opens, log in to your Kodak or Shutterfly account using your username and password by clicking the Sign In link. If you do not have a username and password, you can create one from this screen. Order photo books from the Adobe Photoshop Services browser. If you are already a member, click the Sign In link in the upper-right corner of the dialog box, type your e-mail address and password, and press Next. 10 Specify the cover material and quantity, and then press Next. 11 Type in your location information, and then press Next. 12 Confirm your order details, and add more recipients if desired. Press Next. 13 Choose a shipping method and coupon information (if applicable), and then press Next. 14 Type in your credit card information. Press Place Order to order your photo book. 15 Return to the Editor and press the Done button to close and save your photo book. When getting photo projects ready for photo books, think about how the images will appear in printed format. Also, consider how books are structured when deciding which photos should go on each page. And for best results, you should always preview your projects before ordering books to make sure photos are optimally placed, cropped, and framed.